This Marmot Halo 6 Person Tent Review is about the new 2018 version of the popular tent, that has been considerably improved. The doors are huge now and the tent comes with two large vestibules. It offers 96.7 + 64 ft² (9 + 6 m²) of the protected area. Marmot Halo 6 Person Family Camping Tent shown without the fly. The new version is slightly heavier, some 300 grams or so. The new version is 14 cm lower. The new version is also a bit smaller, 5 cm in the two dimensions. So you have 100 ft² (9.3 m²) in the old version and 96.7 ft² (9 m²) in the new version. The floor fabric in the new version is much more durable, now you see why it is heavier. The doors on the new tent are huge, probably twice the size of the doors in the previous version. There are two symmetric vestibules in the new version. So this was for those who were familiar with the previous version, now a few words for those who are new to this tent. The Halo 6 is a single room dome style tent with a full coverage fly. This is a 3-season tent in the true sense, it should protect you in any weather conditions. The structure is partly freestanding and this is because of the main poles that create the usual X-shape structure, so when you put them in the corner grommets, they are kept in place with the sleeves that go over the top of the tent. But there is an extra pole on the front which creates the large vestibule, see the picture below, and the side flaps of the vestibule must be staked to the ground to have a proper tension in the fly and to have the vestibule functional. The word ‘halo’ in the name is due to the two extra brow poles that cross the main poles around the tent, creating a full circle. You can see them in the picture above. The vestibule is rolled up, observe the vestibule pole. Note that both versions are available on the market and you can see them here, so don’t get confused. The easiest way to know which is which are the doors, they are double wide in the new tent. Observe that they have also launched the new version of their Marmot Halo 4 tent. Sizewise, the tent offers 96.7 + 64 ft² (9 + 6 m²) of the protected area. The first number indicates the inner floor area. So this is 16 ft² (1.5 m²) per person, plus the storage area under the vestibules. Obviously, they have used the backpacking principle to determine the capacity of this tent. It offers enough space for 6 people sleeping on the floor and you have the vestibules for storage, but for real camping you should reduce this number drastically, say to 3 or maximum 4 people. Seasons-wise, the tent is with the full coverage fly and the waterproof rating is quite good, so it should protect you from elements in any weather conditions in a 3-season use. Weight-wise, the tent is heavy; you have 20 lb 1.3 oz (9.11 kg). You will see in the specifications they also give the minimum weight. If you are not familiar see more here, but this implies reducing the weight by leaving some elements at home. But this is still a heavy tool and you would not want to carry it anywhere. This is a camping tent to be used at places with a motorized access. The packed size is really great, it is such that you can transport it even on a motorbike. An awning created with the front flap. I have already described them above, so here just to stress that you have them 5. Those are the top-notch DAC and DAC DA17. If you are not familiar, DAC is the leading poles manufacturer in the world, and the DA17 are special poles they developed for larger family camping tents. The pole diameter is 13 mm and 14.5 mm. The two ‘halo’ poles create 4 intersections with the main dome poles and this makes the structure particularly stable. This principle with poles intersections is used in the construction of the winter dome tents, and this is not without reason. The canopy fabric is 40D 100% polyester No-See-Um mesh F/R, and 68D 100% polyester Taffeta F/R. The fly fabric is 68D 100% polyester ripstop with 1800 mm waterproof rating, also F/R. This is equivalent to around 2.7 PSI; if you are more familiar with this terminology, see more in my another text. So this is the same as in the previous 2017 version. The front vestibule is with dual parallel zippers, so it allows for an awning configuration shown in one of the pictures above. You will use your trekking poles for this purpose. But the catenary cut floor fabric is now 150D 100% polyester Oxford with 3000 mm rating and F/R, as compared to 70D nylon in the previous version. This is the same as 4.27 PSI. More about tent materials you can see in this text. There are several pockets in the corners, and yet another light pocket is above so you can put your headlamp there and have an ambient light. There are two zippered windows on the inner tent, and their purpose is only for ventilation. So these are double layer structures. In combination with the vents on the fly and all the mesh on the doors and on the ceiling, you should have a good ventilation in spite of its full coverage fly. Small inner area per person. Max weight: 20 lb 1.3 oz (9.11 kg). Min weight: 19 lb 5 oz (8.76 kg). Dimensions: 118 x 118 in (300 x 300 cm). Floor area: 96.7 ft² (9 m²). Peak height: 76 in (192 cm). Vestibule area: 32 + 32 ft² (3 + 3 m²). Packed size: 25 x 14 in (64 x 36 cm). In the table below I give this Halo 6 tent side by side with two other new models on the market, both designed for car camping. This might help to make an informed choice. Please follow the links in the table to read more. I would summarize this Marmot Halo 6 Person Tent review with the following: they have improved the tent in three important aspects, i) the floor is far stronger, ii) the doors are much bigger, and iii) the vestibules area is also bigger. But the tent is lower and the floor area is slightly reduced. The tent is expensive as it has always been, but you should know that the new version is less expensive than the previous one. I have no doubts about its quality, I have trust in this brand. This is why I have added it to my list of the best dome camping tents. If you want something completely different, please check these tents which follow a completely different concept, with a large living room and several sleeping rooms: Eurohike Buckingham Elite 6, Eurohike Rydal 6, and Eurohike Hampton 6. 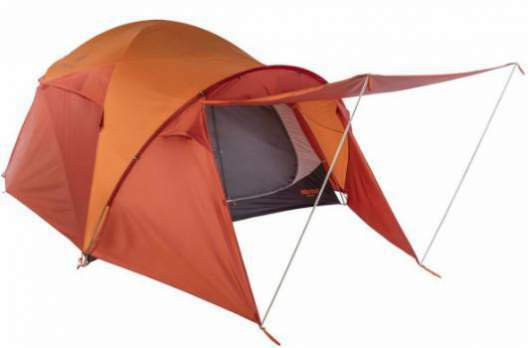 Check also this Vango Omega 500XL Tent with three rooms and 5000 mm waterproof rating. 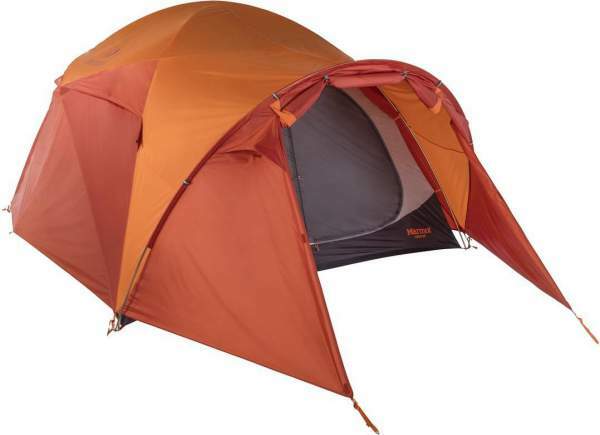 If you need something far more affordable, check this Alprang 6 tent. Please let me know if you have any comment or question, there is a comment box below. Have a nice day. I have a marmot 6p halo with rainfly. I would like to get the new and improved rainfly. Will it fit my 6p marmot halo? Hi Terry, in my text about the new Marmot Halo 6, I gave the summary of changes. You realize that this is a rather different construction with an extra pole in the vestibule, it is also ower and smaller. But it is best that you contact Marmot and ask.